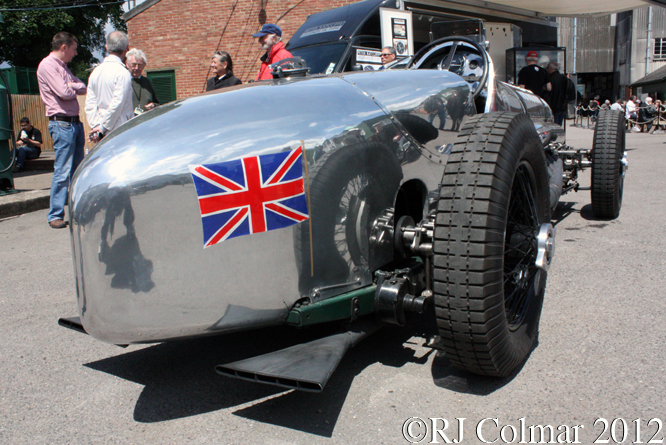 Last week I looked at the Birkin Bentley with which Tim Birkin set the outright Brooklands circuit record from John Cobb driving a V12 Delage at 137.58 mph in 1932. In order to regain the Brooklands outer circuit record John Cobb commissioned Thomson & Taylor to build a racing car to replace his 1923 Delage. 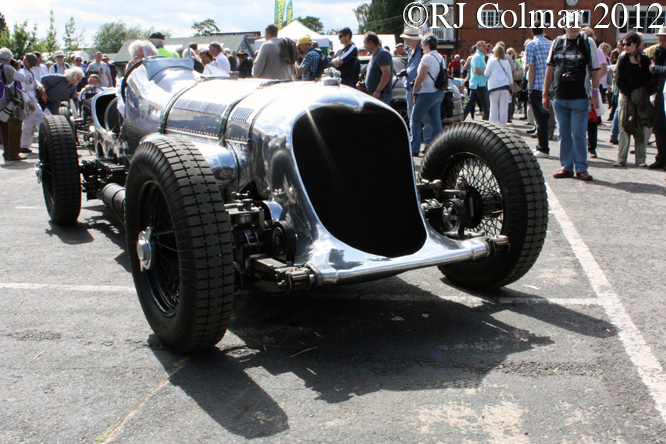 Ried A Railton was given the task of developing what has become known as the Napier Railton around a 24 litre / 14,627 cui 12 cylinder Napier Lion motor that started life as a design for aviation applications in 1917. 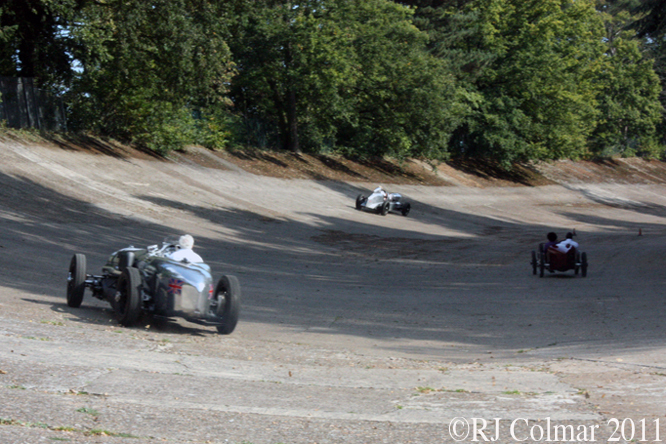 The extremely rough nature of the 2.75 mile Brooklands outer circuit meant that no single detail of the new challenger could be anything less than rock solid to withstand the pounding punishment of the concrete track which would regularly pitch cars into the air at speeds in excess of 120 mph. 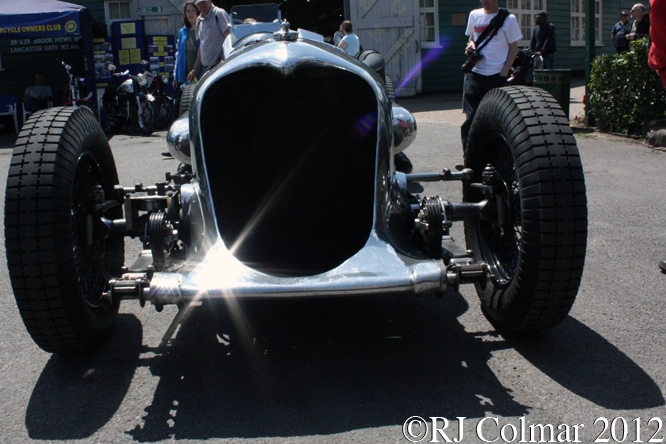 Weighing in at two tons the Napier Railton had a theoretical top speed of over 160 mph, despite this it was only fitted with 16 inch rear drum brakes to save weight. 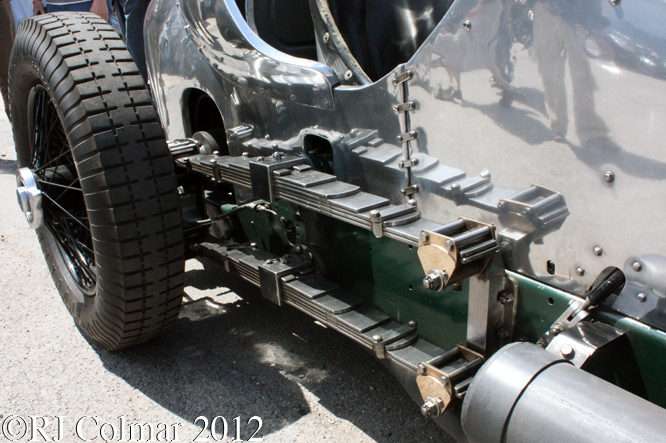 Equipped with beam axles, front and rear, the front one was suspended by a pair of semi-elliptic leaf springs and four friction dampers. 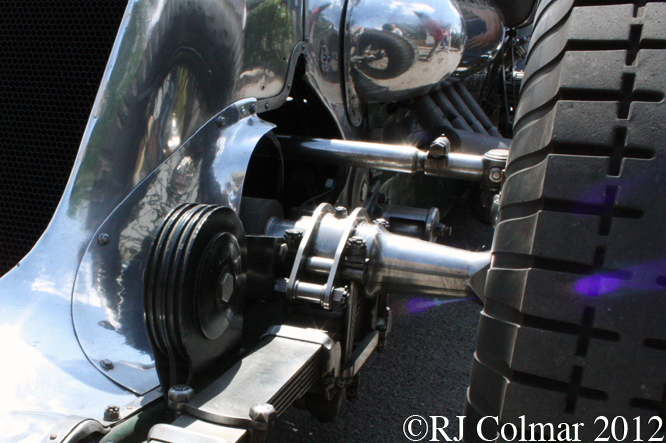 Where ever the eye falls on the Napier Railton there is an overwhelming sense of strength, above the front leaf spring, on the right is the beam axle ahead of the steering arm on the left. During it’s first tests the Dunlop tyres proved wholly inadequate, but this problem was overcome by the time Cobb made his first appearance in the car at Brooklands in 1933. Despite it’s large capacity the Napier Lion motor with it’s three banks of four cylinders each with twim overhead cam shafts was relatively compact, compared to a similar capacity V12 with two row’s of six cylinders for example. 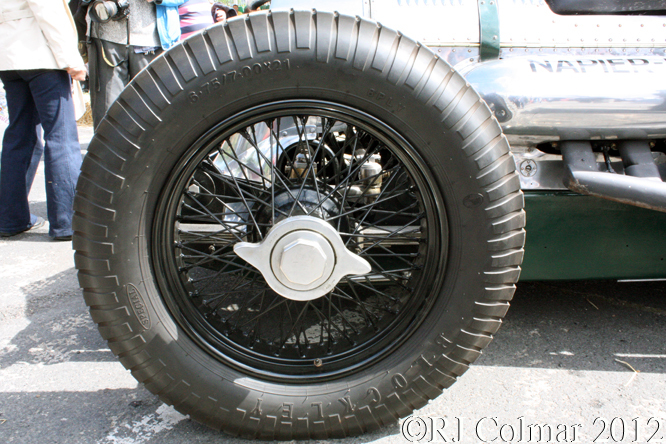 However in order to keep the machine stable over the bumps at speed the Napier Railton has a 130 inch wheel base with a 60 inch track front and rear. 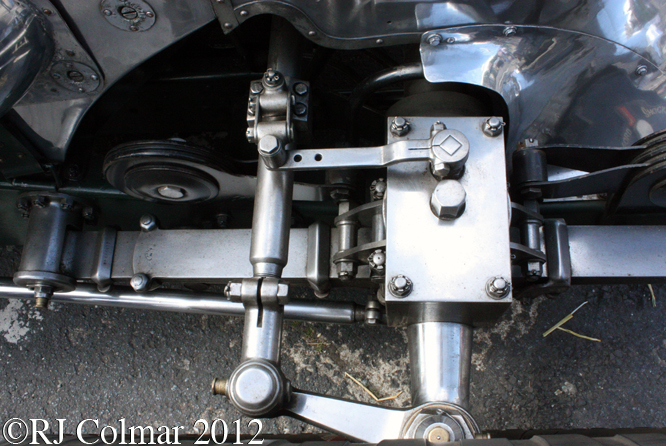 The mounting points for the twin rear leaf spring sets is alongside the cockpit. 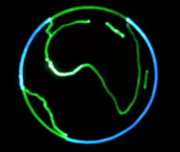 The huge revolution counter did not have to work particularly hard the Napier Lion produced over 500 hp at just 2,200 revolutions per minuet. 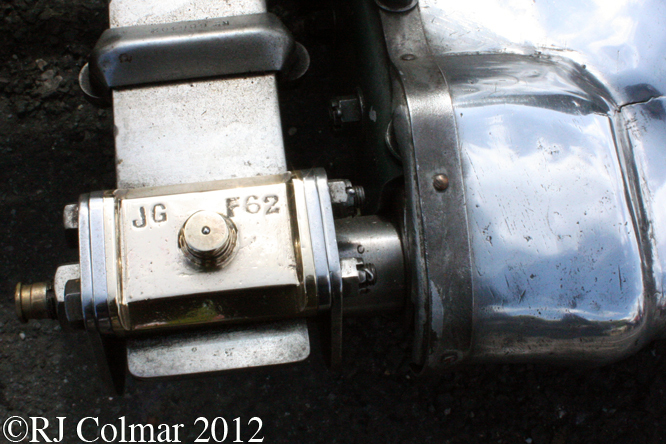 The gear box had three forward gears and no reverse. 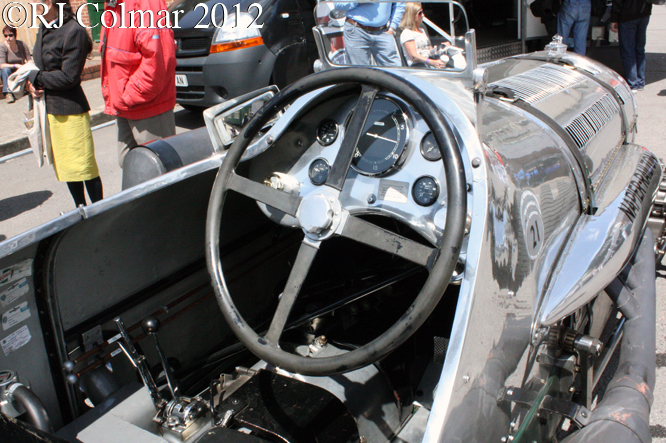 The bare aluminium bodywork is credited as being by Gurney Nutting. 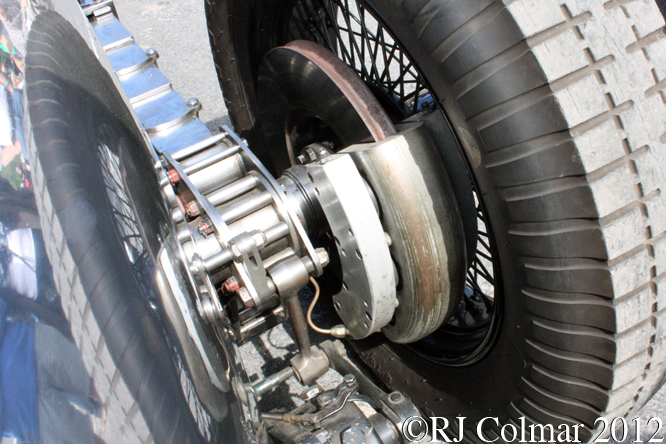 After it’s success on the track pre 1939 and after an appearance in the film Pandora and the Flying Dutchman alongside James Mason and Ava Gardner released in 1951, the rear drum brakes were replaced with these aircraft style disc brakes so that the car could be used to test aircraft braking parachutes by the GQ Parachute Company at Dunsfold Aerodrome in the early 1950’s. 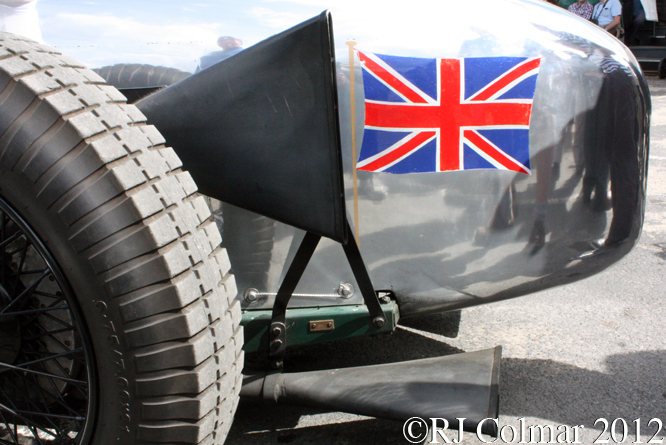 After John Cobb set the outright Brooklands circuit record at 143.44 mph, thanks to the subsequent break up of the circuit a record that will stand in perpetuity, Cobb took the Napier Railton to Bonneville Salt Flats where he set a world 24 hour record at 150.6 mph. 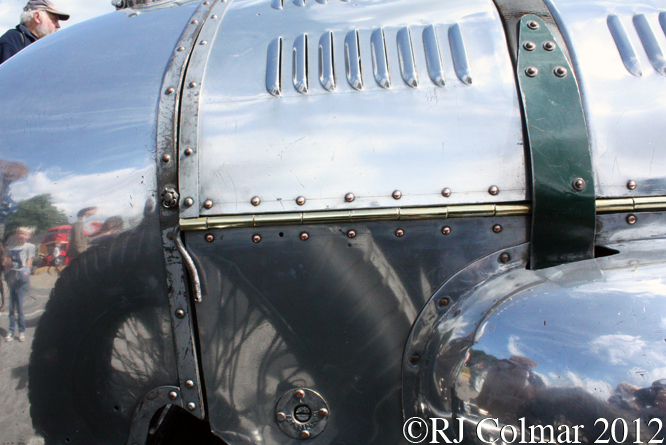 John Cobb and Reid A Railton would work together again on the Railton Special featuring two Napier Lion engines, one driving each axle. The Railton Special became the first car to exceed 350 mph in 1939 and renamed the Railton Mobil Special it became the first car timed over 400 mph in 1947 when Cobb left the Land Speed Record at a two way average of 394.19 mph. Cobb was killed making an attempt on the water speed record in his jet powered boat Crusader in 1953. In 1997 the Brooklands Museum acquired the car after it had been repatriated from a collection in Leipzig. 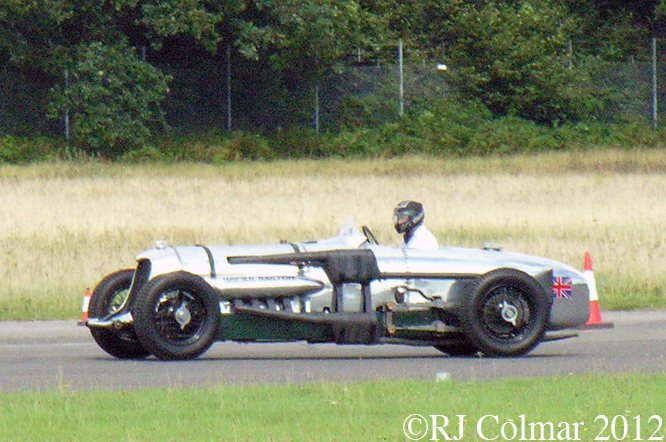 When not in view at the Brooklands Museum or on what remains of the Brooklands track the Napier Railton can be seen doing what it does best at events like Wings and Wheels at Dunsfold Aerodrome. 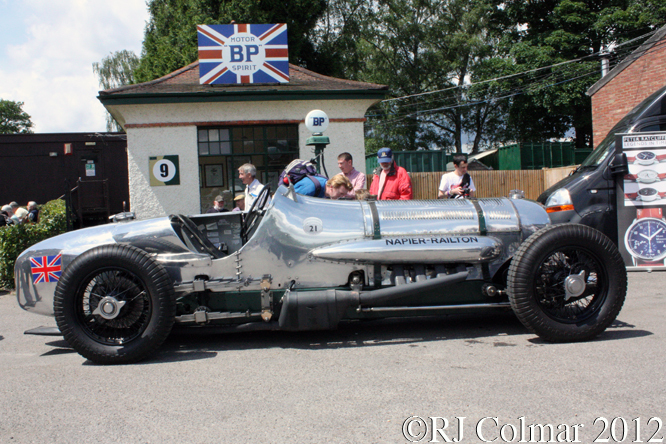 This entry was posted in Uncategorized and tagged A, Bonneville, Brooklands, Cobb, Colmar, Dunsfold, GALPOT, Gurney, John, Lion, Napier, Nutting, Pandora and the Flying Dutchman, Railton, Ralph, Reid, Thompson & Taylor on September 12, 2012 by Ralph. 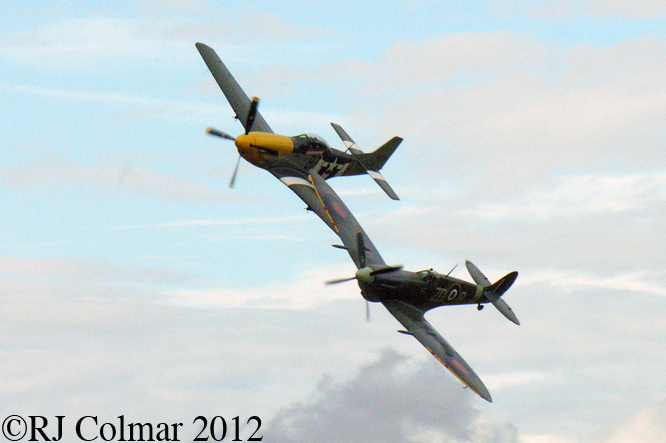 Last Monday I went to Dunsfold Aerodrome for a bit of a school reunion organised by my friend David. The last time I attended an event similar to Wings & Wheels was at Biggin Hill in 1972 when as a thirteen year old I was impressed by both the motor vehicles on display and the aircraft. 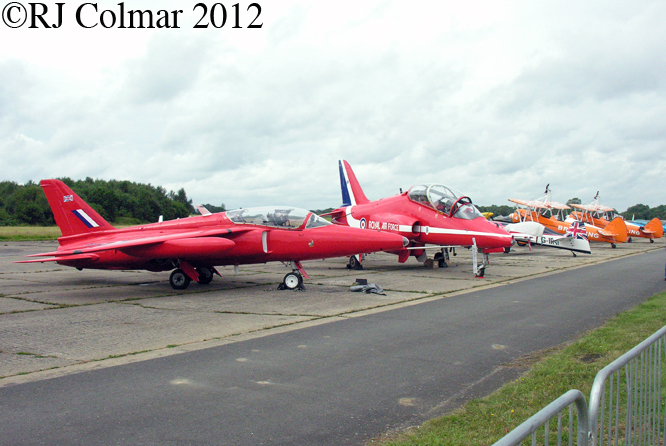 While I was looking for David after arriving I stumbled across the old and new faces of the Red Arrow’s the little Folland Gnat which was used by the display team from 1965 until they were replaced by the larger BAe Hawk in 1979. The AEC Regent double deck bus, predecessor of the much loved Routemaster, was developed in 1939. RT2775 seen here is one of three that were selected to represent the British Travel and Holidays Association and London Transport on a tour of the USA and Canada to promote travel to Britain and the purchase of British products in 1952. 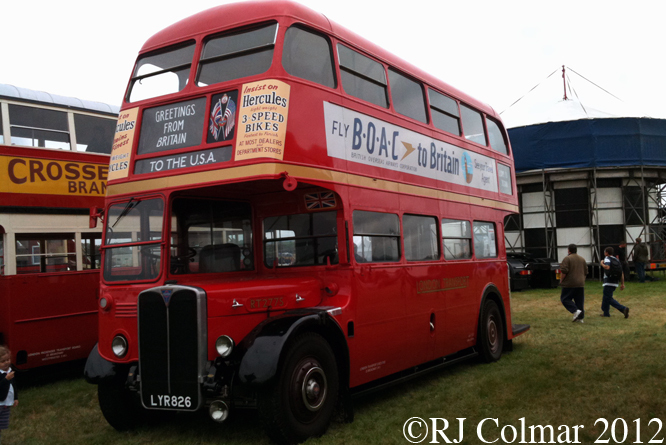 Because of it’s special status as an ambassador abroad it unusually kept it’s identity through out it’s working life when it returned to the streets of in 1953 where it remained in service until 1977 after which it became part of the Cobham Bus Museum which is now housed at Brooklands. 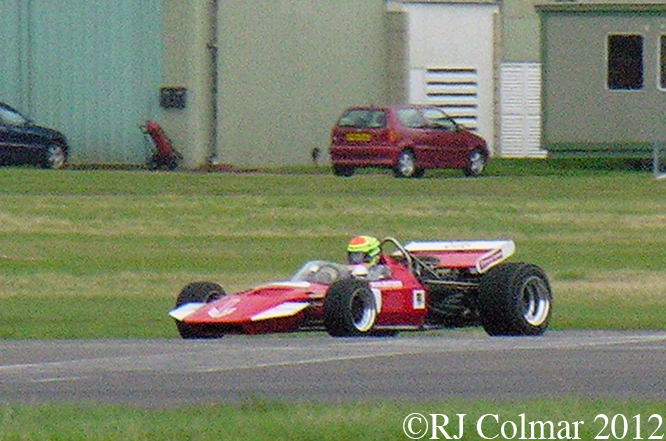 One of several pleasant surprises at Duxford was seeing this 1970 Surtees Ford TS7 designed in part by Peter Connew who regular GALPOT readers will remember went on to design and build his own eponymous Grand Prix car after his work on the TS7 was completed. 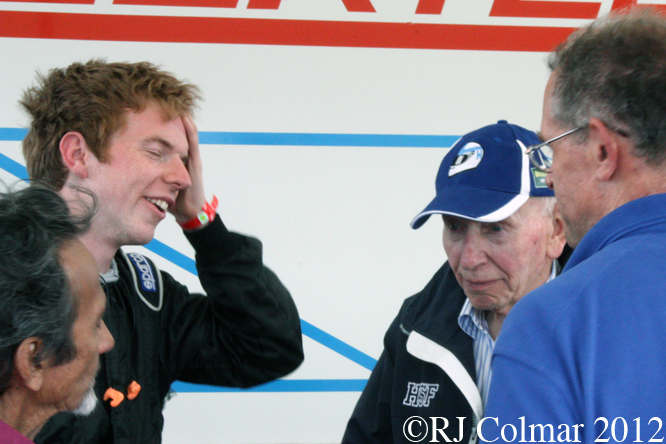 Sahab Ahmed with whom Peter worked on the design of the TS7 can be seen on the left of McLaren test driver Oliver Turvey and John Surtees, the only man to win World Championships on two and four wheels in the photo above. 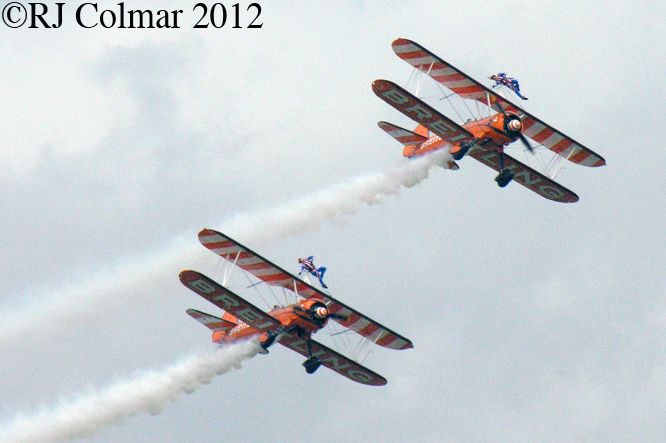 As someone prone two vertigo by the time I get to the third rung on a ladder I found the Breitling Wing Walkers a genuinely mind boggling sight. A team of six pilots share the flying duties of the pair of 1940’s era Boeing Stearmans, while a team of six very brave women share the wing walking duties while traveling at 150 mph and experiencing up to 4G ! A couple of huge explosions on the ground which scared the brown stuff out of me as I had my back to the airfield at the time preempted the arrival of a pair of swing wing Panavia Tornado GR4’s and a simulated ground attack demonstration. These aircraft which have been operation for the last 20 years were deployed last year in the liberation of Libya and are currently deployed as part of the allied forces in Afghanistan. With two Rolls Royce conceived RB199 jet engines fitted with afterburners this multirole platform can reach speeds of Mach 2. Manufactured in Buffalo New York the 1943 Curtis P40M Kittyhawk / Warhawk fighter seen above served in the Royal Canadian Airforce amassing just 732 flying hours before it was retired in 1950 when it became an instructional aircraft at Oregon State University. In the early 80’s after a long period of storage she was restored to full airworthiness in California. More recently she was flown to Prague where she stared in the film Red Tails released earlier this year. The Napier Railton seen above not only holds the Brooklands lap record in perpetuity but after the ’39-’45 war it was fitted with heftey aircraft style Dunlop rear disc brakes and used to test experimental aircraft braking parachutes on this very same runway by the GQ Parachute Company which was based at Dunsfold Aerodrome. Some of the backdrops in today’s photographs may also be familiar to avid fans of the Top Gear television show which operates from a studio on the site. 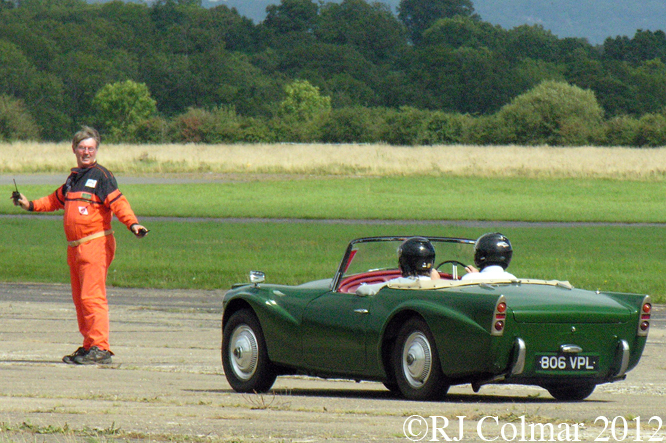 Among the many vehicles demonstrated on the runway was this 1961 Daimler SP250 which I post a picture of especially for one of GALPOT’s most loyal readers Ryan also known as Racer 187. 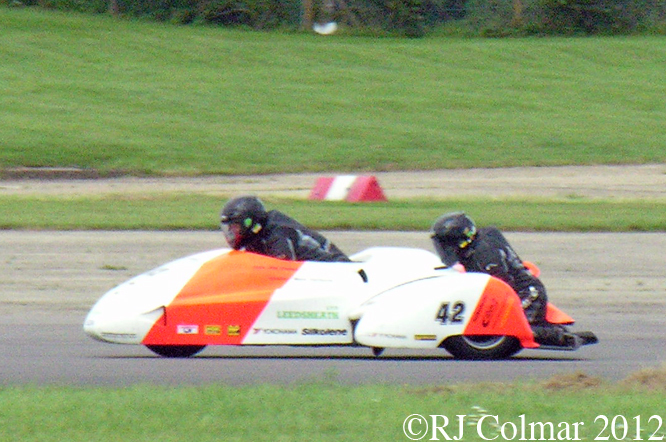 I can’t vouch for the accuracy of the programme which tells me that the side car combination above is a 1972 Honda, but I am reasonably certain the person at the helm is the remarkable Neil Trundle who has spent over 40 years in motorsport working with the likes of Jack Brabham, setting up shop with Ron Dennis building the famous six wheel Tyrrell P3/4’s then joining Dennis again at Project 4 Motorsport which took over McLaren. If you know what type of combination Neil is riding please do not hesitate to chime in below. 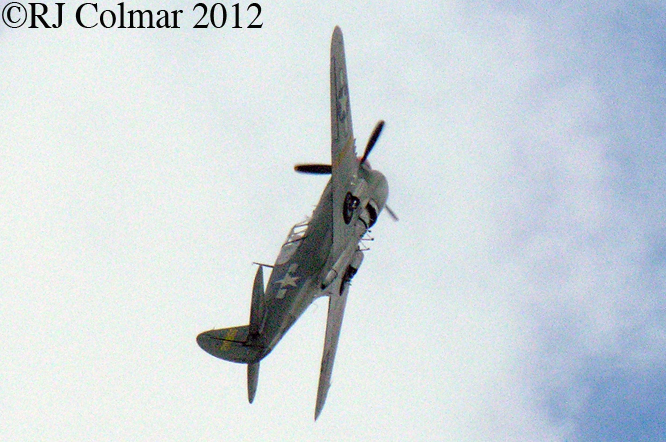 As the day came to an the 1945 North American P51-D Mustang, above on the left and 1943 Supermarine Spitfire IXB gave us a more than welcome double dose of, respectively, Packard and Rolls Royce built Merlin music as they waltzed the sky. Just before I said good bye to my school friends and left the last flying Avro Vulcan caressed the sky and if nothing else showed that if it had ever been used as originally intended, to deliver a nuclear payload, it would have wasted the world in mutually assured destruction with elegance and grace. As it was after the Vulcan’s nuclear defense capabilities were deemed surplus to requirements several of them were converted for low level conventional bombing roles. A single Vulcan delivered twenty one 1,000lbs on Port Stanley airport in 1981, though it is debatable how effective the worlds longest range bombing sortie was as Argentinian forces, which had invaded the Falklands Islands, were able to repair the damage to the runway. The invaders were subsequently dispatched by the yomping British ground forces. 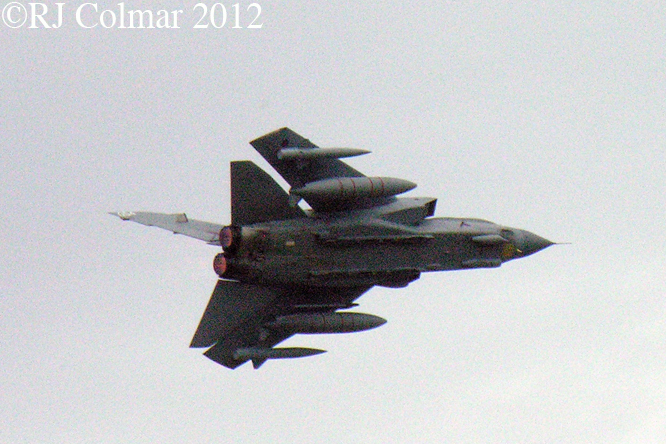 The Vulcans were eventually replaced by the Panavia Tornado’s seen at Dunsfold earlier in the day. 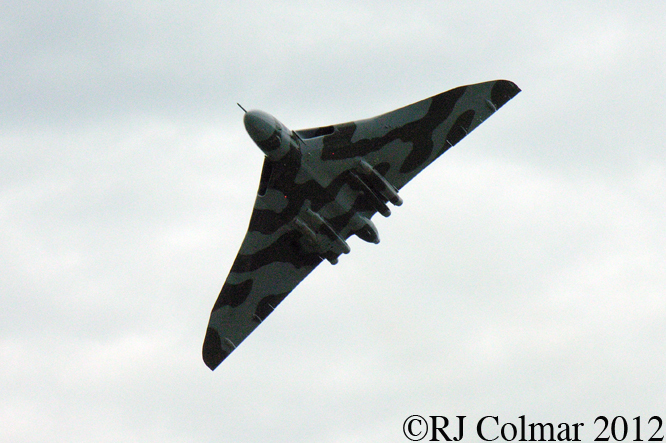 This Vulcan has been restored to airworthy condition by The Vulcan To The Sky trust thanks to over £7 million raised from public subscription, if you are interested in helping to keep it in the air please visit the Vulcan to the sky site linked here. Thanks for joining me on this “Wings & Wheels” edition of “Gettin’ a li’l psycho on tyres” I hope you will join me again tomorrow when I will be breaking from the usual Tuesday MG edition to celebrate an unusual 45th Anniversary. Don’t forget to come back now ! This entry was posted in Uncategorized and tagged AEC, Aerodrome, American, Avro, BAe, Boeing, Colmar, Curtis, Daimler, Dunsfold, Folland, GALPOT, Honda, Napier, North, Panavia, Railton, Ralph, Supermarine, Surtees, Wheels, Wings on September 3, 2012 by Ralph.